Come and experience our new Comforts of Home 53 Bedding Collection. Candlewood Suites is not your traditional hotel, and that is the best part At the Candlewood Suites Las Vegas we put the amenities where they really count: in the rooms That means a big suite with a full kitchen and plenty of space to stretch out Each suite has a full kitchen complete with microwave, full sized refrigerator and all your utensils and pans to cook with. You can work efficiently at your oversized executive desk using high speed Internet as well as two separate phone lines, check email and talk on the phone at the same time. Relax in the overstuffed recliner while you enjoy a video borrowed from the hotel in your VCR or a CD in your CD player. Work off some stress in our fitness center or visit our Candlewood Cupboard. In the Candlewood Cupboard you can purchase meals, snacks, and sundry items at value prices. 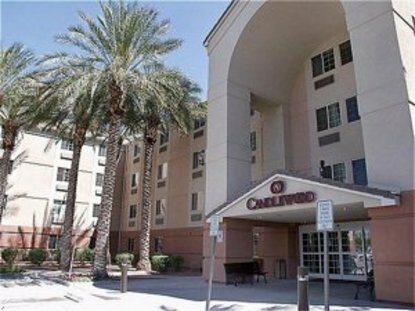 The Candlewood Suites Las Vegas is conveniently located to all the exciting spots that Vegas has to offer. We are .5 miles from the fabulous Las Vegas "Strip", 1 mile north of McCarran International Airport and .5 miles from the Las Vegas Convention Center. Pets allowed with a non refundable fee based on length of stay. $75 for 1-6 nights and $150 for 7+ nights. One pet allowed per suite, must weigh less than 80 lbs. Pet agreement must be signed at check in. This hotel is committed to providing accessible facilities under the American Disabilities Act. If your accessibility needs are not met, please contact the Hotel Manager on Duty. Should you require additional information regarding accessible facilities for guests with disabilities, please call 1-800-Holiday (U.S. and Canada) or contact the hotel directly. For the hearing impaired, TDD service is available at 1-800-238-5544 within the U.S. and Canada.